Activated NK T cells are known to rapidly stimulate NK cells and, subsequently, CD8+ T cells and B cells. In this report, we first demonstrate that the downstream effects induced by α-galactosylceramide activated NK T cells on NK cells are mainly dependent on IFN-γ. We found that NK T cell activation of NK cells requires a functional IFN-γ signaling in macrophages and dendritic cells but not in B cells, NK cells, or NK T cells. NK T cell activation is dendritic cell-dependent whereas NK T cell activation of NK cells is indirect and in part mediated by macrophages. Interestingly, in this context, macrophage participation in the CD1d Ag presentation of α-galactosylceramide to NK T cells is not necessary. These data indicate that NK T cell-dependent activation of macrophages is required for optimal NK T cell-induced stimulation of NK cells. Natural killer T cells are a unique subset of T lymphocytes that rapidly produce Th1 and Th2 cytokines, most notably IFN-γ and IL-4, upon activation (1, 2). There are four known subsets of NK T cells, each differing in their TCR repertoire, MHC restriction, Ag specificity, expression of NK cell markers, and location (1, 3). The most widely studied group is the invariant Vα14Jα18 NK T cells (Vα14i NK T).3 These lymphocytes have a restricted TCR repertoire, characterized by the expression of a Vα14Jα18 rearrangement with an invariant junction, preferentially associated with Vβ8.2 chains. Vα14i NK T cells are CD4+CD8− or double negative and are dependent on a nonclassical, nonpolymorphic MHC class I-like molecule, CD1d, for positive selection, Ag presentation, and activation (2). A synthetic glycolipid, α-galactosylceramide (α-GalCer), has been shown to be a potent and specific activator of Vα14i NK T cells when presented by CD1d (4, 5). The presentation of α-GalCer by CD1d, which is widely expressed on dendritic cell (DC), macrophages (Mφ), B cells, and T cells (6), rapidly induces the activation of Vα14i NK T cells. These cells produce both IL-4 and IFN-γ (7) but it is not clear whether they can be polarized (8, 9, 10, 11). Following activation, these cells quickly induce the activation of NK cells, and, subsequently, other cell types including CD8+ T cells and B cells via cross-talk (12, 13, 14, 15, 16). The activation of NK cells is particularly important for the antitumor effects of α-GalCer stimulated by Vα14i NK T cells (16). In this report, we define the mechanism of Vα14i NK T cell-induced activation of NK cells and identify an unanticipated role for macrophages as a critical intermediate between Vα14i NK T cells and NK cells. TCRβ-FITC, CD5-FITC, CD19-FITC, CD45.1-FITC, CD45.2-FITC, CD4-allophycocyanin, TCRβ-allophycocyanin, and NK1.1-allophycocyanin were purchased from eBioscience. DX5-PE, CD1d-PE, NK1.1-PE, CD11c-PE, CD11b-PerCP, CD4-PerCP, NK1.1-PerCP-Cy5.5, IFN-γ-allophycocyanin, and isotype controls were purchased from BD Pharmingen. α-GalCer was synthesized by the Kirin Brewery and kindly provided by Dr. K. Miyayama (Kirin Brewery, Gunma, Japan). α-GalCer and vehicle-loaded CD1d tetramers conjugated with PE were produced as described previously (7) or obtained from the National Institute of Allergy and Infectious Disease MHC Tetramer Core Facility. The following mAbs were purchased from BD Pharmingen and used for ELISA: IFN-γ mAbs (clone R4-6A2, and clone XMG1.2), IL-4 mAbs (clone 4B11 and BVD6-24G2), and streptavidin-peroxidase. For the in vivo neutralization of IL-12, functional grade purified anti-IL-12p70 (clone C17.8) was purchased from eBioscience. Inbred C57BL/6 and B6.SJL-Ptprca/BoAiTac mice were purchased from Taconic Laboratory Animals and Services. C57BL/6 IFN-γR1−/− and C57BL/6 IL-12p40−/− mice were purchased from The Jackson Laboratory. C57BL/6 CD1d−/− mice (17) were kindly provided by Dr. L. Van Kaer (Vanderbilt University, Nashville, TN) and bred in our facility. STAT1−/− mice on a C57BL/6 background were kindly provided by Drs. C. Biron and J. Durbin (Brown University, Providence, RI). C57BL/6 Jα281−/− mice (4) were kindly provided by Dr. M. Taniguchi (Riken Research Center for Allergy and Immunology, Yokohoma, Japan) and bred in our facility. Mice were treated i.p. with either 2 μg of α-GalCer or 100 μl vehicle (0.5% polysorbate-20). For in vivo neutralization of IL-12, mice were treated i.p. with anti-IL-12p70 12 h before α-GalCer treatment. All mice were 4- to 8-wk-old males, except where indicated, and experiments were conducted in accordance with institutional guidelines for animal care. Hepatic lymphocytes were isolated by mincing tissue and pressing through a 70 μm nylon cell strainer (Falcon). Cell suspensions were layered onto a two-step discontinuous Percoll gradient (Pharmacia Fine Chemicals). Splenic lymphocytes were isolated by mincing and passing through nylon mesh (Tetko). Cell suspensions were layered onto Lympholyte-M (Cedarlane Laboratories). For in vitro cultures and for in vivo IL-12 intracellular staining (ICS), whole spleens were first digested with collagenase (Liberase CI; Roche Diagnostics) as described (18, 19). In brief, spleens were injected with 1 ml of Liberase CI in serum-free DMEM, macerated with a needle, and transferred to a 37°C water bath for 45 min. RBC were lysed using ammonium chloride and cells were then washed with PBS containing 3% serum and passed through nylon mesh before separation with Lympholyte-M. Where indicated, lymphocytes were positively selected for CD19+, DX5+, CD11c+, and/or CD11b+ cells before culture using magnetic beads specific for each surface marker and the AutoMACS cell separator (Miltenyi Biotec). Isolated lymphocytes were prepared for flow cytometric analysis, blocked with 2.4G2 anti-Fc mAb, and labeled with indicated mAbs. ICS for IFN-γ protein was performed using the Cytofix/Cytoperm kit (BD Pharmingen). For analysis of intracellular IL-12, lymphocytes were first depleted of CD19+, CD5+, and DX5+ cells using the AutoMACS ex vivo and treated with brefeldin A (Sigma-Aldrich) for 3 h before preparation for FACS analysis. All flow cytometric analyses were performed using the FACSCalibur and Cell Quest software (BD Biosciences). Following isolation of lymphocytes and positive selection for specific subsets as described above, 5 × 106 splenocytes from STAT1−/−, IL-12p40−/−, C57BL/6, and C57BL/6.SJL were cultured alone or 2.5 × 106 splenocytes from STAT1−/−, IL-12p40−/−, and C57BL/6 were cocultured with equal numbers of C57BL/6.SJL splenocytes in the presence of 100 ng/ml α-GalCer or 1 μl/ml DMSO (Sigma-Aldrich). In additional experiments, 5 × 106 splenocytes from IL-12p40−/− or C57BL/6 were cocultured with α-GalCer or DMSO and either 2.5 × 105 CD11c+ or CD11b+CD11c− cells isolated from CD1d−/− spleens, or 1 × 106 total CD1d−/− splenocytes. All cultures were plated onto 24-well culture plates (Corning) in 1 ml of DMEM with 8% FCS per well for 36–40 h. The supernatant was then collected for ELISA and lymphocytes were prepared for flow cytometric analysis as described above. Previous studies have suggested that both IFN-γ and IL-12 are essential components of the Vα14i NK T cell-induced activation of NK cells (12, 13). Here, upon immunization of wild-type mice or mice deficient in either IFN-γ signaling or IL-12 with α-GalCer or vehicle, we confirm the critical role of IFN-γ and IL-12 (Fig. 1⇓A). A clear reduction of the percentage of NK cells producing IFN-γ following α-GalCer immunization can be seen in IL-12, STAT1, and IFN-γR1-deficient animals when compared with wild-type mice. At 6 h postimmunization, 31.26 ± 2.09% of B6 hepatic NK cells synthesize IFN-γ whereas only 9.86 ± 3.44 of IFN-γR1−/− and 5.10 ± 0.96% STAT1−/− liver NK cells synthesize IFN-γ. Interestingly, the absence of IFN-γ signaling results in a more pronounced NK cell IFN-γ defect in the liver than in the spleen. The data also demonstrate that, in the absence of IFN-γ signaling, a significant number of NK cells can still be activated by Vα14i NK T cells whereas only few NK cells can be activated in the absence of IL-12 (Fig. 1⇓A). Other cytokines such as IL-18 could explain the residual NK activation seen in IL-12-deficient animals (20, 21). Further, we also show that the transcription factor STAT1 is essential in the Vα14i NK T cell/NK cell cross-talk (Fig. 1⇓A). Interestingly, the treatment of STAT1−/− mice, i.p., with anti-IL-12p70 mAb 12 h before α-GalCer injection did not completely abolish the Vα14i NK T cell’s ability to stimulate NK cells (Fig. 1⇓B). In the STAT1−/− mice that received both α-GalCer and the neutralizing mAb, the decrease in NK cell IFN-γ observed in these mice was only slightly greater than those that received only the α-GalCer injection (3.18 ± 0.09% vs 5.82 ± 0.35% in the liver). Taken together, these findings suggest that STAT1 signaling is required for the induction of IL-12 (Fig. 1⇓B), and demonstrate that Vα14i NK T cell activation of NK cells is dependent on IL-12 and IFN-γ signaling. Vα14i NK T/NK cell cross-talk is impaired in STAT1−/−, IFN-γR1−/−, and IL-12p40−/− mice. A, Splenic and hepatic leukocytes were isolated from α-GalCer or vehicle-immunized mice at 6 h postinjection followed by permeabilization and staining for intracellular IFN-γ. IFN-γ production in NK cells isolated from the spleen and liver is shown. Results shown are from one experiment per protocol and are expressed as mean ± SD of three mice per group. One experiment representative of two to five is shown. B, Before injection of α-GalCer, mice were treated with anti-IL-12p70 or control. Results were analyzed as in A. One experiment representative of two independent experiments is shown. A lower number of Vα14i NK T cells in IL-12p40−/− and IFN-γR1−/− mice could explain the results seen in Fig. 1⇑. Therefore, we examined the Vα14i NK T cell population in the STAT1−/−, IFN-γR1−/−, and IL-12p40−/− mice in comparison to the wild-type C57BL/6 animals. Using CD1d tetramers loaded with α-GalCer, we demonstrate that the percentage and absolute number of the Vα14i NK T cells in IFN-γR1−/−, IL-12p40−/−, and wild-type mice are similar (Fig. 2⇓, A and B). However, although not statistically significant, we consistently observed a lower number of Vα14i NK T cells in the STAT1−/− mice in comparison to the wild-type animals. It is also well known that mice deficient in IFN-γ and STAT1 have a lower level of MHC class I expression and it is conceivable that the effects described above were the result of a lower level of CD1d expression. We found that CD1d cell surface expression on STAT1−/−, IFN-γR1−/−, IL-12p40−/−, and C57BL/6 splenocytes is comparable (Fig. 2⇓C). Vα14i NK T cell number and CD1d expression are comparable in STAT1−/−, IFN-γR1−/−, IL-12p40−/−, and B6 mice. A, Lymphocytes from naive mice were isolated and stained with TCRβ, α-GalCer/CD1d tetramer, NK1.1, and CD4 and analyzed by FACS. B, The percentage and absolute number of CD1d tetramer-positive cells are shown. One experiment representative of two to five independent experiments of three to six mice per group is shown. C, Splenic lymphocytes were isolated and stained for CD19, CD1d, and TCRβ and analyzed by FACS. Each panel is an overlay of the isotype control (open histogram) and the anti-CD1d mAb (solid histogram) of CD19+ cells. One experiment representative of two separate experiments is shown. The lower percentage of NK cells producing IFN-γ following α-GalCer immunization seen in IL-12 and STAT-1-deficient animals could result from a functional defect of the Vα14i NK T and/or NK cells. To investigate these possibilities, we first measured the serum IL-4 concentration and hepatic intracellular IFN-γ of mice at 2 h post-α-GalCer immunization. At this early time point, serum IL-4 is strictly dependent of the Vα14i NK T cells and is therefore an excellent indicator of the Vα14i NK T cell’s ability to respond to Ag-specific stimulation (22). We found that both the IL-4 serum level and the percent of IFN-γ+ Vα14i NK T cells were similar in the STAT1−/−, IL-12p40−/−, and wild-type mice (Fig. 3⇓, A and B). These results demonstrate that Vα14i NK T cells are not functionally impaired in STAT1−/− or IL-12p40−/− mice. Also, these data clearly show that the initial Vα14i NK T cell activation is independent of both IFN-γ signaling and IL-12. Vα14i NK T and NK cells are functional in the absence of IFN-γ signaling and IL-12. A, Serum from α-GalCer or vehicle-immunized mice was collected at 2 h posttreatment. Serum IL-4 was measured by ELISA. Results shown are from one experiment representative of three and are expressed as mean ± SD of five mice per group. B, Hepatic leukocytes were isolated from α-GalCer or vehicle-immunized mice at 2 h postinjection followed by permeabilization and staining for intracellular IFN-γ. IFN-γ production in NK T cells isolated from liver is shown. C, A total of 2.5 × 106–3 × 106 total splenic lymphocytes from B6, STAT1−/−, or IL-12p40−/− mice were cocultured with equal numbers of total splenic lymphocytes from the congenic C57BL/6.SJL mice at 37°C. in the presence of either 100 ng/ml α-GalCer or 1 μl/ml DMSO. At 36 h postculture, cells were collected and stained for CD5, NK1.1, CD45.2, and intracellular IFN-γ. The percentage of IFN-γ-producing NK cells for each source is shown. One experiment representative of three independent experiments is shown. To address whether the NK cell populations isolated from the STAT1−/− and IL-12p40−/− mice were functional, we established a method that would allow us to measure NK cell IFN-γ intracellularly in vitro. It is well known that the addition of α-GalCer to splenocytes activates Vα14i NK T cells and that cytokines can be subsequently detected in the supernatant. However, we found that NK cell-derived IFN-γ is best detected by ICS if spleens are first digested with Liberase CI (18). This enzyme treatment considerably increases the total cell yield, and the percentage of splenic DC and Mφ, presumably enhancing the efficiency of α-GalCer presentation. Initially, time course experiments were performed to determine the optimal time-point at which to measure IFN-γ from NK cells by ICS. In these conditions, NK cell-derived IFN-γ peaks between 36 and 40 h postculture. Using this method, cocultures of either STAT1−/− or IL-12p40−/− and congenic C57BL/6.SJL-derived splenocytes were established in the presence of α-GalCer or DMSO. The STAT1−/− and IL-12p40−/− NK cells, defined as CD5−/NK1.1+ cells, distinguishable from the wild-type congenic NK cells based on their expression of CD45.2, responded as well as the wild-type cells (CD45.2-negative) within the same well (Fig. 3⇑C). In contrast when STAT1−/− or IL-12p40−/− splenocytes are cultured in the presence of α-GalCer but in the absence of congenic B6 splenocytes, only a weak stimulation of the STAT1−/− NK cells and no stimulation of the IL-12p40−/− NK cells could be observed (Fig. 3⇑C, bottom left panel). These data confirm that STAT1−/− and IL-12p40−/− NK cells are functional and, additionally, provide evidence that the Vα14i NK T/NK cell cross-talk is indirect. 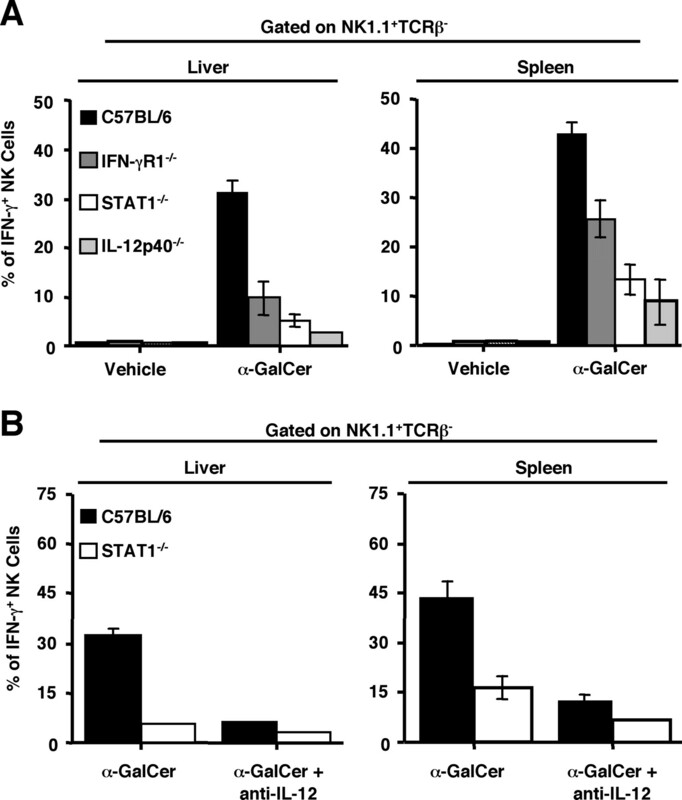 Taken together these results demonstrate that the inability of NK cells from IL-12p40−/− and STAT1−/− mice to respond fully to α-GalCer-stimulated Vα14i NK T cells is not due to an intrinsic functional defect in either the Vα14i NK T or NK cells. As shown in Fig. 3⇑, our experiments using the congenic wild-type B6-derived splenocytes mixed with either splenocytes from STAT1−/− or IL-12p40−/− mice indicate that their NK cell-IFN-γ response could be rescued to, or near, wild-type levels. A plausible explanation for these results was that a critical subset of cells possessing both a functional IFN-γ signaling pathway and the ability to secrete IL-12 was added to the culture. To define this population, we established coculture experiments from IL-12p40−/− splenocytes and purified cellular subsets from CD1d−/− mice. The use of CD1d−/− mice allows a direct examination of the effects of the addition of different cell populations without concerns that any observed recovery was merely the result of the addition of CD1d+ APC or Vα14i NK T cells. Also, CD1d can serve as a marker to distinguish between the different sources of cells. We found that addition of CD19+/CD1d−/− or DX5+/CD1d−/− cells to IL-12p40 −/− splenocytes had no effect on the NK cell-derived IFN-γ response 36 h postculture (not shown). The addition of CD11c+/CD1d−/− cells (DC) had a relatively weak effect on this response (Fig. 4⇓A) presumably due to the lack of CD1d expression of these cells. In contrast, addition of the CD11b+/CD11c−/CD1d−/− subset (Mφ) was sufficient to render NK cells responsive to α-GalCer-activated Vα14i NK T cells. These data demonstrate an unanticipated and critical role for macrophages during the Vα14i NK T cell activation of NK cells in vitro. To further confirm that the identified critical intermediate was a macrophage, additional experiments were conducted in which the CD11c−CD11b+ CD1d−/− subset was separated into two separate populations based on their expression of the Mφ-specific marker F4/80 using FACS. Total splenocytes isolated from IL-12p40−/− animals were cocultured with either CD11b+F4/80+ or CD11b+F4/80− subsets in the presence of α-GalCer for 36–40 h. The addition of the CD11b+F4/80− subset failed to recover the IL-12p40−/− NK cell-derived IFN-γ response in vitro whereas the coculture of the CD11b+F4/80+ subset and IL-12p40−/− splenocytes significantly enhanced this response (not shown). Taken together, these data provide clear evidence that, in vitro, a Mφ intermediate is critical for optimal Vα14i NK T cell-induced activation of NK cells. In addition, the fact that the CD11b+/CD11c− cells were derived from CD1d−/− mice demonstrates that the participation of the macrophages is independent of Ag presentation. CD11c−CD11b+ cells are required for optimal Vα14i NK T/NK cell cross-talk. A, A total of 5 × 106 total splenic lymphocytes from IL-12p40−/− or B6 mice were cocultured with either 2.5 × 105 CD11c+ or CD11b+CD11c− cells from CD1d−/− mice at 37°C in the presence of either 100 ng/ml α-GalCer or DMSO. At 40 h postculture, cells were harvested and stained for CD5, NK1.1, CD1d, and intracellular IFN-γ. IFN-γ production in NK cells is shown. The percentage of IFN-γ+ NK cells from IL-12p40−/− splenocytes cocultured with CD1d−CD11b+CD11c− is statistically significantly different (p ≤ 0.0007) in all five experiments when compared with NK cell IFN-γ from IL-12p40−/− splenocytes. B, Splenic leukocytes from B6 and IL-12p40−/− mice were isolated from α-GalCer or vehicle-immunized mice. CD19, CD5, and DX5 depleted cells were stained for intracellular IL-12. One experiment representative of three independent experiments is shown. C, Splenic leukocytes from B6 and IL-12p40−/− mice were isolated from α-GalCer or vehicle-immunized mice at 2, 4, and 6 h postinjection. Results were analyzed as in Fig. 4⇓B. One experiment representative of three independent experiments is shown. In agreement with the in vitro results described above, we found that in addition to DC (Fig. 4⇑B and Ref. 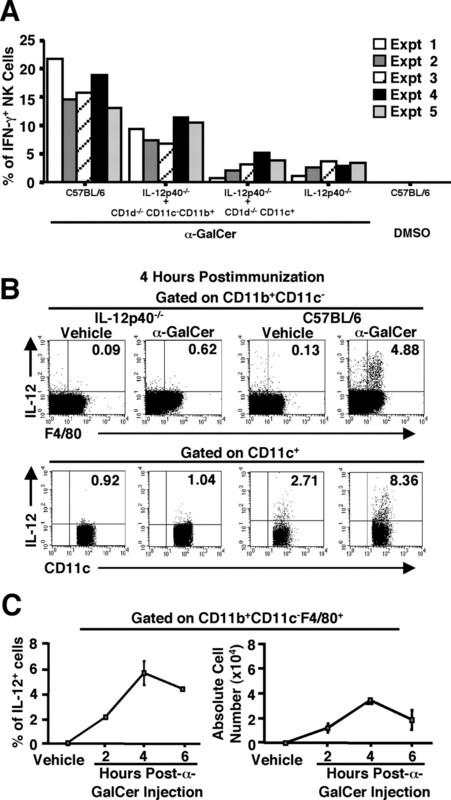 23), CD11c−CD11b+F4/80+ cells produce IL-12 following α-GalCer immunization (Fig. 4⇑B). Interestingly, Mφ-derived IL-12 peaks at 4 h (Fig. 4⇑C) and precedes the peak of NK cell IFN-γ (not shown and Ref. 10) highlighting the critical role of the macrophages. Previous reports have suggested that optimal activation of Vα14i NK T cells is dependent of CD40-CD40L interaction and release of IL-12 from DC (24, 25). Our findings demonstrated that IL-12 is not critical for the initial Vα14i NK T cell stimulation. Others have shown that activation of Vα14i NK T cells by α-GalCer induces a full maturation of DCs in vivo (26, 27, 28). In addition to DC, which are essential for the initial NK T cell activation, we also identified Mφ as a critical intermediate of the Vα14i NK T cell activation of NK cells. These experiments further confirm that IFN-γ does not directly induce the activation of NK cells to produce IFN-γ. Rather, this cytokine acts indirectly by inducing the production of IL-12, which activates the NK cell population. These findings may have broader consequences for understanding the role of Vα14i NK T cells in bridging innate and adaptive immunity. For example, we speculate that a targeted activation of Vα14i NK T cells leading to NK cell and Mφ activation could significantly contribute to the generation of an optimal immune response to intracellular pathogens. We thank Dr. K. Miyayama for providing α-GalCer. We also thank Drs. M. Dalod, G. Yap, and C. Biron for critical review of the manuscript. ↵1 This work was supported in part by National Institutes of Health Research Grant AI46709 (to L.B.) and U.S. Department of Education Pre-Doctoral Training Grant P200A000117 (to J.D.W. and S.H.R.). ↵3 Abbreviations used in this paper: Vα14i NK T, Vα14Jα18 NK T cell; α-GalCer, α-galactosylceramide; DC, dendritic cell; Mφ, macrophage; ICS, intracellular staining. Brigl, M., M. B. Brenner. 2004. CD1: antigen presentation and T cell function. Annu. Rev. Immunol. 22:817. Hammond, K. J., S. B. Pelikan, N. Y. Crowe, E. Randle-Barrett, T. Nakayama, M. Taniguchi, M. J. Smyth, I. R. van Driel, R. Scollay, A. G. Baxter, D. I. Godfrey. 1999. NKT cells are phenotypically and functionally diverse. Eur. J. Immunol. 29:3768. Brossay, L., D. Jullien, S. Cardell, B. C. Sydora, N. Burdin, R. L. Modlin, M. Kronenberg. 1997. Mouse CD1 is mainly expressed on hemopoietic-derived cells. J. Immunol. 159:1216. Miyamoto, K., S. Miyake, T. Yamamura. 2001. A synthetic glycolipid prevents autoimmune encephalomyelitis by inducing TH2 bias of natural killer T cells. Nature 413:531. Schmieg, J., G. Yang, R. W. Franck, M. Tsuji. 2003. Superior protection against malaria and melanoma metastases by a C-glycoside analogue of the natural killer T cell ligand α-galactosylceramide. J. Exp. Med. 198:1631. Matsuda, J. L., L. Gapin, J. L. Baron, S. Sidobre, D. B. Stetson, M. Mohrs, R. M. Locksley, M. Kronenberg. 2003. Mouse Vα14i natural killer T cells are resistant to cytokine polarization in vivo. Proc. Natl. Acad. Sci. USA 100:8395. Stetson, D. B., M. Mohrs, R. L. Reinhardt, J. L. Baron, Z. E. Wang, L. Gapin, M. Kronenberg, R. M. Locksley. 2003. Constitutive cytokine mRNAs mark natural killer (NK) and NK T cells poised for rapid effector function. J. Exp. Med. 198:1069. Carnaud, C., D. Lee, O. Donnars, S. H. Park, A. Beavis, Y. Koezuka, A. Bendelac. 1999. Cutting edge: cross-talk between cells of the innate immune system: NKT cells rapidly activate NK cells. J. Immunol. 163:4647. Burdin, N., L. Brossay, M. Kronenberg. 1999. Immunization with α-galactosylceramide polarizes CD1-reactive NK T cells towards Th2 cytokine synthesis. Eur. J. Immunol. 29:2014. Kitamura, H., A. Ohta, M. Sekimoto, M. Sato, K. Iwakabe, M. Nakui, T. Yahata, H. Meng, T. Koda, S. Nishimura, et al 2000. α-Galactosylceramide induces early B-cell activation through IL-4 production by NKT cells. Cell Immunol. 199:37. Dalod, M., T. P. Salazar-Mather, L. Malmgaard, C. Lewis, C. Asselin-Paturel, F. Briere, G. Trinchieri, C. A. Biron. 2002. Interferon α/β and interleukin 12 responses to viral infections: pathways regulating dendritic cell cytokine expression in vivo. J. Exp. Med. 195:517. Baxevanis, C. N., A. D. Gritzapis, M. Papamichail. 2003. In vivo antitumor activity of NKT cells activated by the combination of IL-12 and IL-18. J. Immunol. 171:2953. Hashimoto, W., F. Tanaka, P. D. Robbins, M. Taniguchi, H. Okamura, M. T. Lotze, H. Tahara. 2003. Natural killer, but not natural killer T, cells play a necessary role in the promotion of an innate antitumor response induced by IL-18. Int. J. Cancer 103:508. Parekh, V. V., A. K. Singh, M. T. Wilson, D. Olivares-Villagomez, J. S. Bezbradica, H. Inazawa, H. Ehara, T. Sakai, I. Serizawa, L. Wu, et al 2004. Quantitative and qualitative differences in the in vivo response of NKT cells to distinct α and β-anomeric glycolipids. J. Immunol. 173:3693. Fujii, S., K. Liu, C. Smith, A. J. Bonito, R. M. Steinman. 2004. The linkage of innate to adaptive immunity via maturing dendritic cells in vivo requires CD40 ligation in addition to antigen presentation and CD80/86 costimulation. J. Exp. Med. 199:1607. Kitamura, H., K. Iwakabe, T. Yahata, S. Nishimura, A. Ohta, Y. Ohmi, M. Sato, K. Takeda, K. Okumura, L. Van Kaer, et al 1999. 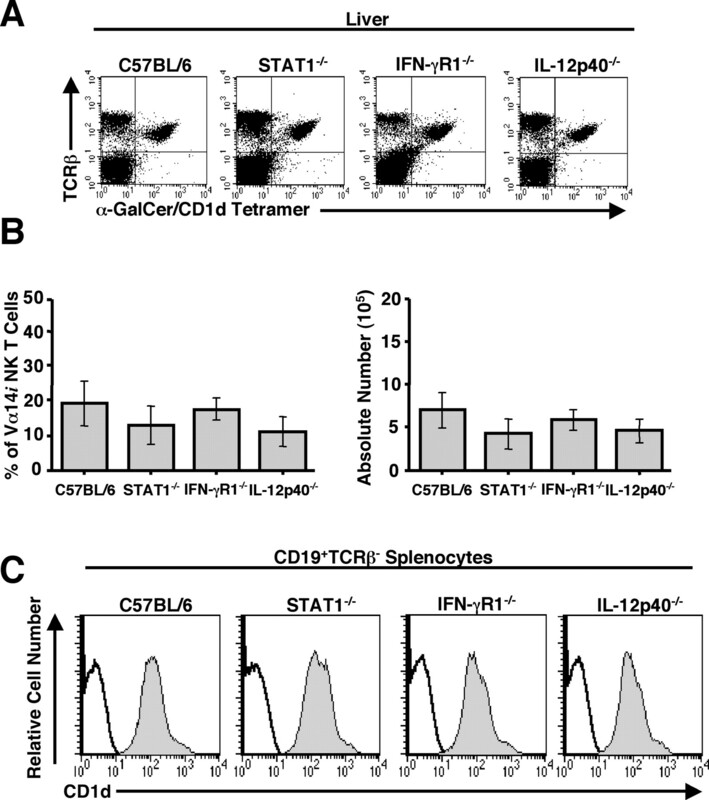 The natural killer T (NKT) cell ligand α-galactosylceramide demonstrates its immunopotentiating effect by inducing interleukin (IL)-12 production by dendritic cells and IL-12 receptor expression on NKT cells. J. Exp. Med. 189:1121. Tomura, M., W. G. Yu, H. J. Ahn, M. Yamashita, Y. F. Yang, S. Ono, T. Hamaoka, T. Kawano, M. Taniguchi, Y. Koezuka, H. Fujiwara. 1999. A novel function of Vα14+CD4+NKT cells: stimulation of IL-12 production by antigen-presenting cells in the innate immune system. J. Immunol. 163:93. Fujii, S., K. Shimizu, C. Smith, L. Bonifaz, R. M. Steinman. 2003. Activation of natural killer T cells by α-galactosylceramide rapidly induces the full maturation of dendritic cells in vivo and thereby acts as an adjuvant for combined CD4 and CD8 T cell immunity to a coadministered protein. J. Exp. Med. 198:267. Gillessen, S., Y. N. Naumov, E. E. Nieuwenhuis, M. A. Exley, F. S. Lee, N. Mach, A. D. Luster, R. S. Blumberg, M. Taniguchi, S. P. Balk, et al 2003. CD1d-restricted T cells regulate dendritic cell function and antitumor immunity in a granulocyte-macrophage colony-stimulating factor-dependent fashion. Proc. Natl. Acad. Sci. USA 100:8874.